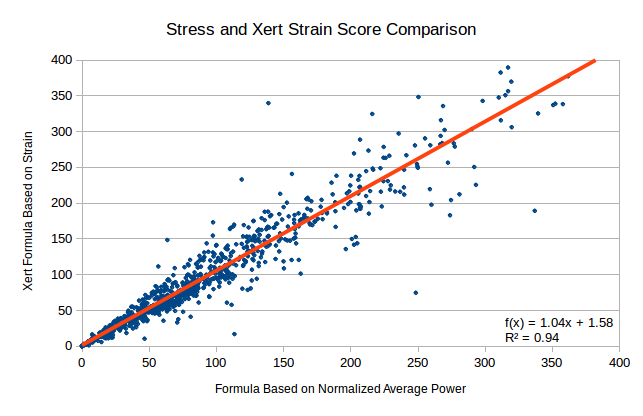 Also called XSS, this quantifies how much strain an athlete endures during an activity. By taking strain, which is measured as the amount of work performed close to MPA, and normalizing it with the athlete’s Fitness Signature, one-hour at Threshold Power equates to 100 XSS. Note that an athlete can experience greater than 100 XSS in an hour if the work is performed under short-term fatigue. That is, 100 XSS is one hour at Threshold Power, unfatigued. Under fatigue, one hour at Threshold Power can be much higher than 100 XSS. XSS can be subdivided into low (XLSS), high (XHSS) and peak (XPSS) according to work allocation ratios. Xert Mobile, for example, will provide real-time XLSS, XHSS and XPSS totals during the recording of an activity. Each of these strain scores can be used in separate Training Load and Recovery Load calculations which can then map to individual Impulse Response models for each Fitness Signature parameter.